Dan Choi Found Guilty, Fined $100 - Joe.My.God. 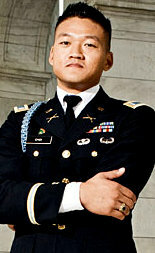 The guilty finding against Daniel Choi came as the West Point graduate tried to turn the usually staid courtroom of the District’s federal court into a lively venue for protesting his prosecution for his role in the November 2010 demonstration. In court on Thursday, Choi’s erratic demeanor swung from emotional outbursts at the lectern to belligerent confrontations with a U.S. Park Police officer and the federal prosecutor. Dressed in a military uniform, Choi paced the courtroom, serving as his own lawyer. “All I want at the end of this day is to return to the U.S. military,” Choi said through tears. Choi, who is not trained as an attorney, alternated between whispered apologies for his teary breakdowns and loud rebukes of Assistant U.S. Attorney Angela George for failing to refer to him as a lieutenant. The twelve others arrested plead guilty at the time and received deferred sentences. Choi, however, had refused to do the same. Another source reports that Choi was transported to a VA hospital after the trial. He faces jail time if he refuses to pay the fine.